All transactions are safe and secure with a reliable history in online purchasing behind each of our associates. 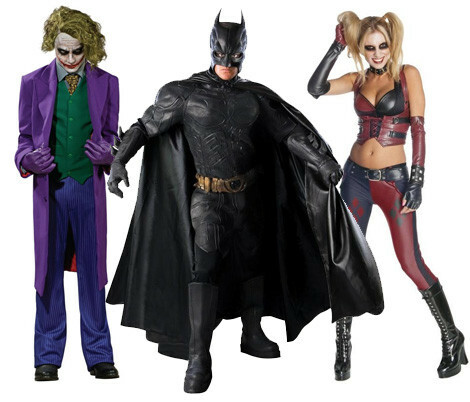 Buy the Batman Costumes for Adults and Kids, Joker Costume, Batman Masks to own Batman clothing and merchandise. Choose from a variety of Batman costumes for kids and adults, including the coveted Heath Ledger Joker costume and Batman's Dark Knight outfit. If you find the supporting characters more appealing, be sure to check out the Harley Quinn and Poison Ivy costumes. Peruse a variety of accessories, including Bat gloves, grappling hooks and Batarangs. Character masks including Dark Knight clown masks are also available. In addition to the Batman Costumes for Adults and Kids, Joker Costume, Batman Masks above, browse the Batman Clothing Gallery for more apparel like men's and women's clothes, kids shirts or hoodies.